It’s a love triangle of epic proportions, except that two of the three don’t know that the other exists. Marissa Moreau is recently a not-so-happily married part-owner of New Heights, a pregnancy crisis center. In her world of troubles, she believes her husband is potentially being unfaithful to her and is still grieving over the loss of a pregnancy and a continuous battle of infertility. Unfortunately, she believes he may be cheating because of her infertility problems, and begins spying on him, only to discover far more than she had ever bargained for. Colin, Marissa’s husband, is a distinguished professor who has the perfect life, except for the fact it’s all a facade. He’s got a gorgeous wife, an established career, coaches boy’s Little League and is up for tenure. It can’t get much better than that, only that he’s unhappy in his marriage and has a woman on the side. What’s worse is that this woman is actually one of his students, which could ruin not only his marriage, but the career he’s worked so hard for. While this fact should stop him, it doesn’t until it’s far too late and she becomes pregnant, threatening everything he’s ever worked for. Kaitlyn Farrows is a college student, employee at The Bean - a local coffee shop - and, most importantly, newly pregnant by a man she can’t even claim she has a relationship with because of his career. She knew that seeing her college professor was a bad idea, but it never stopped her. Now Kaitlyn is pregnant and will have to quit school. Once she quits school, however, there’s no reason they can’t take their relationship further and make it public…except he broke it off, without even knowing she’s pregnant. Desperate to make a way for her and the baby, with or without Colin’s help, she takes up a second job at New Heights where she is finally accepted and feels at least partly secure. Now if only Colin would listen to her and take her back. Thankfully, she doesn’t have to go through all this alone. Marissa and Kaitlyn quickly become friends and sources of support to one another. While neither shares too much about their personal situations, they know the gist of what is happening in each other's lives and try to help each other out as much as possible. Colin, completely unaware that his wife and his pregnant mistress know one another and are actually friends, and the girls, not knowing just how intertwined their lives are, are in for the surprise of their lives because, as always, the truth always comes out. It’s up to love, hope and faith to keep them all going through this time, no matter how it ends. Georgiana Daniels has made the characters of this book so relatable that it makes you wonder what you would do in the characters' shoes. Would you ever forgive your husband for such an unspeakable act? Would you stay with him or be unable to deal with what he’s done? Could you remain friends with the woman he cheated on you with? Although religion is lightly mentioned throughout the book, it’s so woven in that it’s not overbearing for those who aren’t particularly religious, but those who are can still contemplate what it means to forgive as a Christian. It truly makes you ask yourself what your limits are and how you would handle such a situation. By the end of the book, you are cheering for Marissa and feeling for her situation, while dying to know the outcome and what is next. 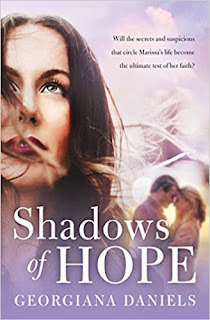 I do hope there will be another book in this series, because I don’t quite want to part with Marissa and I certainly want to see how Kaitlyn and her new baby girl develop as time goes by. Quill says: Shadows of Hope is a lightly suspenseful read that leaves you unwilling to put it down. #BookReview - May I Come In?